Finches are popular pet birds because they're fun to watch and easy to care for -- some seeds, fresh water and a bathtub and they're all set. No need to buy and rotate toys or provide hours of human interaction. Finch owners can just enjoy the show as the birds flit back and forth, chattering and singing to one another. Finches much prefer the company of other finches to humans, however, so each needs a playmate, soul mate and life mate. Since it's not in their nature to interact with humans, it's best to keep a pair of finches, which often become mates for life. Single birds naturally will pay more attention to their humans. However, rather than becoming tame, they're more likely to show signs of loneliness. Single finches often become depressed, may vocalize loudly in despair and show signs of distress such as feather-picking. A single pair needs a cage at least 28 inches long and 20 inches high. Each additional pair requires double the length so the pairs don't become competitive and aggressive toward each other. Odd numbers usually are not a good idea. When choosing a pair of finches, look for two who are sitting together or interacting. Be aware, however, that a male and female kept together will breed. To tell males from females, look for the singers. Only male finches sing; female vocalizations are more chirps and beeps. As with most birds, males are also more colorful, but since many finches are brown it's tough to distinguish the sexes. Two females will be happy cage mates. Two males may get along, or they may be aggressive toward each other. Finch parents are attentive and don't require much from you other than a little more seed to eat. It's best if the finch pair is from the same finch family. The most popular family, Estrildidae, includes zebra, society and gouldian finches among others. Although it's best to have a pair of the same kind -- such as two zebras -- birds in the Estrildidae family should be compatible. Canaries are in the Fringillidae family, along with the goldfinch, and shouldn't be kept with finches outside their family. The other finch families are Ploceidae and Passeridae, which are mostly wild birds not commonly kept in captivity. 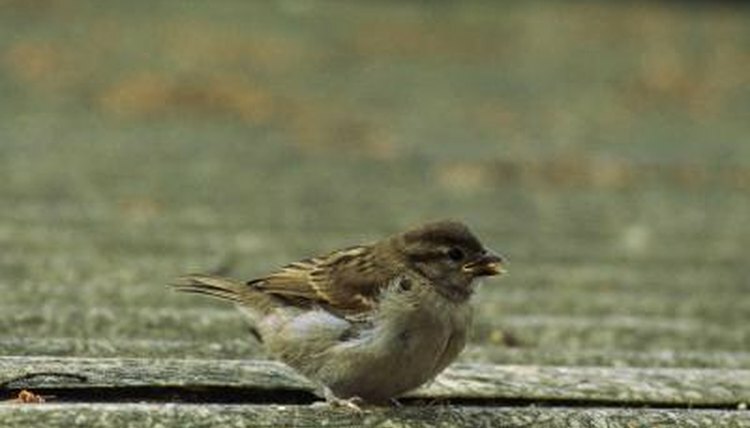 Although finches exhibit similar behavior, there are variances among them. Zebra finches get along with nearly everyone, including non-zebras of the Estrildidae family. Many will greet their owners with chirps and beeps, especially at feeding time. Gouldian finches are known to be the most mild-mannered and quietest in the family, and seem to like attention from their owners. Society finches are the busy-bodies of the family. They're known for interfering with another pair's breeding by trying to help to make the nest and raise the young.